..Is that where the cut on a reveal is? 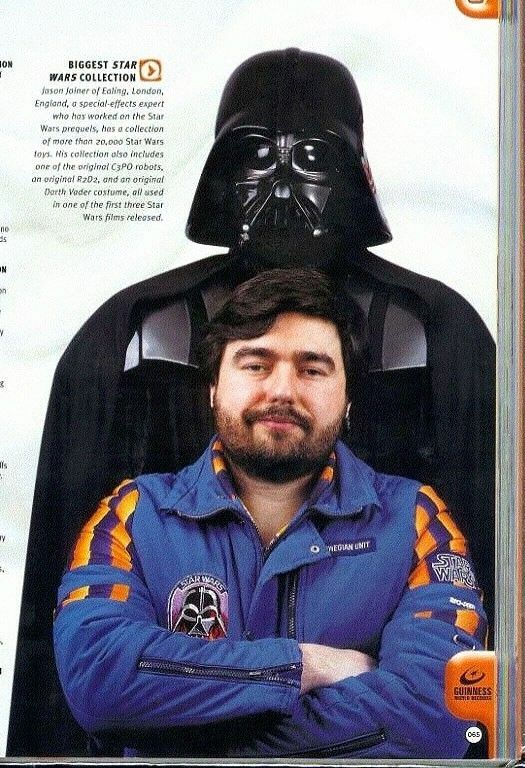 The JJ suit is based off a ROTJ derived and Tour pieces FYI...Take what he says with a pinch of salt regarding original or authentic props as he has very few authentic pieces to start with and usually they have been heavily altered/tampered. I am aware of his track record, and that is why I asked the experts here. I don't agree with the hoarding of images. I am entitled to an opinion or is free speech now banned Paul? It isn't personal Paul, I just disagree with your line on keeping images to yourself and I am entitled to my opinion. Sharing is the way forward for the community and the group knowledge of this HOBBY. I wager that I have spent way more £££'s than you have relating to original props, not that it is a competition, but I have shared photos of all my props. You don't see me posting and saying, "I know but I can't share blah blah blah..."
Anyway back on topic, thanks for your analysis Paul, that was what I wanted to know. To clarify Joe, I am also against hoarding info/images as I said to you in the priviledged section but no matter how much we complain I have not seen it change enough over the years. Because I am part of the Vader community I have to honour what is asked so I go along for the ride just like many before and after me. So we are in agreement, you just don't know it because we are coming from two different perspectives in many respects and I do react to comments like that because I have spent thousands of dollars gaining images over the years which is a sore point at times at how expensive they are and you always get the 'do not share' slogan attached to it, One man's junk is another man's treasure and all that, a simple picture holds all kinds of value if you are a collector, if you're not part of that hobby concerning image collecting than I don't expect you to understand it wholeheartedly or agree with it because I don't at times but there is no denying I am a sharer when I can so I wanted to clear that up. I don't think you can estimate you have spent more than me on Props Joe, but feel free to PM me what you have spent and I will likewise but as you say, it's not a competition so it's a moot point. Going back to Joiner having seen the suit in detail not one part is original but due to some skip hunting in his Elstree days amongst other things I have heard his boasts of original pieces fall flat because I have yet to see a true representation of what's on screen but there is no doubt his stuff is heavily influenced from ROTJ and the Tour era. This was in no particular folder so I'm unsure who's image it is, just let me know if you want it removed, cheers. I understand your viewpoint and BTW I do collect images as well. Taken to pm. Despite some of the tour stuff and replicas, he has owned some original props and has casts of Hero and Stunt Trooper helmets. Anyway I'm supping a San Miguel, let's chill for the weekend. This looks like the tusks have a very short piece of tube attached to them (permanently). Then the tubes on the mask were cut at some point and the remaining space was filled with the tusks that have a short (solid or hollow) tube permanently attached to them.. I've made a lousy job on what I mean since my english is not the best and I can't express myself well on such technical things. Left you see the tusk with a piece of tube permanently attached to it (perhaps the tusk itself as we know it isn't exactly what we think? Maybe there was a found part with this "tusk" on the end and they simply cut the end with this tusk on it, glueing it in place on the mask?). Right ist the tube on the mask. The space is where the tube on the mask was cut. Then this space is filled up with the tube/tusk part? Also, the neckline looks totally weird...just look at the line it describes! Thanks for the pics Joe. As Paul stated, Joiners past claims have been somewhat questionable. Whether they have been deliberate or just based on his lack of knowledge is something I won't speculate on. His displays are nice to look at, but they aren't screenused pieces. No, that's further up, near the cheek, iirc. I've been taking my time with these images which are nice to see as I've always been a bit curious about Joiner's claimed original helmet. It seems on Vader's left tube end a layer of paint flaked off just behind the tusk making it look like a rework but you don't see any sign of a rework or paint flake on the right side. I agree with Paul that it isn't original. I also agree it is likely from the mid-90s tour era. And that it is ROTJ of some kind. There's a detail on Vader's left cheek I swear I saw somewhere before and have been trying to pin it down to something in particular but without luck so far. 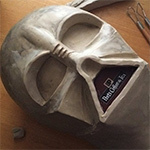 Even though it is supposed to be similar to ROTJ (the dome is ROTJ), the mask made me wonder a bit. The neck edge has a bit of extra material on it similar to the 20th Century. Also the neck edge irregularity on Vader's left side echos a bit what one sees on the 20th C but more so, maybe because the extra material was trimmed off there (???). The lower "worm" (or sausage as I like to call it) on the right cheek is identical to that of the 20th C...shallow spindly shape. There is also that concave indentation on Vader's second from left tooth up where it meets the nose...just as the 20th C (although the GH ROTJ has that as well so not definitive). The nosebridge is identical to that of the 20th C. Even the chin vent is similar (looks the same at first glance although I've not done a comp of the same angle of the 20th C). The teeth also seem to have the reasonably good depth, as the 20th C, something you don't see on a ROTJ mask. I'm not saying it's a 20th C but there are similarities pointing to a similar period. Did he screw up the two-tone paint-job? the top right cheek area with the nail mark shouldn't be grey. Just looks like dust to me. Nope, that's paint. You can see the color separation line at the nose. Dust doesn't fall in a perfectly straight line. Not unless the owner went up to the mask and licked it. Looks like one of those RotJ era tour suits, no? Woah, I just read after posting...Thomas, I dare say you and I almost came to the same conclusion!